Got this comment on Facebook wanted to get the ball rolling to share it with the rest of the community. Sounds like a personal problem of his country. Don't you understand, it's not up to the country its problem of Ambassadors not existing in the game. I guess it would be an improvement ... but its not like its a very active position. We'll the problem of this community is not caring at all, no one giving a opinion, yes or no, or an argument to support. Ambassadors not existing in the game. A lot of things are not officially in game. If they give ambassadors the rights to give citizenships and write articles for free maybe they should give rights to the MoD to press the attack button and change the CoD. But the code is old and they can't implement anything except new packs, or at least this is what Petsku said. Thats the dumbest reason to not modify the game i have ever read... Code doesnt become "old", they could update everything they wish, but they simply dont do it. Why would they change anything in the game when they are getting like 10.000€ in packs every month and who knows how many in gold? Problem is not that... problem is in long term we free users are leaving the game because there is no INCENTIVE to stay in it. Communities die because new players cannot get into game, if that gets fixed... the game could live more because of communities recycling... but who seriously would advertise the game as its currently? Newbies join and simply leave, i have a friend who started like 5 or 6 months ago and she simply tells me she is useless and cant do anything at all. When communities start dying and only one or two countries wage war anymore... then visa-players will simply realize the game is no longer funny for them because they cant "win against nobody"... so they will simply leave and the game will die. So guys, lets not worry about how old the code is and what can be done or not done. I think the idea is really cool, I don't fully agree with ambassador titles as its too much work for governments but I do agree that there should be an official exchange of ambassadors or platform where the official ambassador list is uploaded. Quite keen on organizing a monthly MoFA meeting to discuss MoFA related topics. Perhaps eRepublik can structure it and to some extension police it but let the community run it. Once we have a successful program running we can than take a look how we can get the devs to make the cosmetic changes needed to make it better. 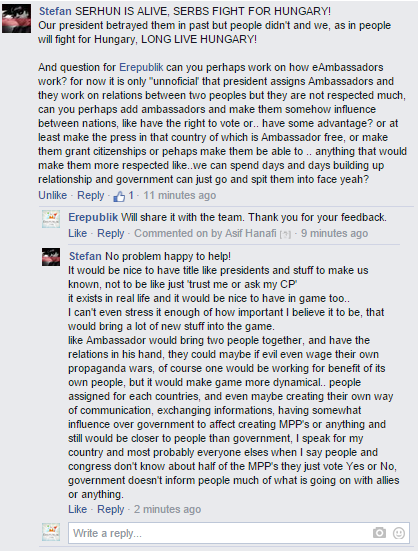 I did not say that they have to give ambassadors the right to give CS or anything i just stated it as example to make Ambassadors voice more heard, and make it more difficult for government who sometimes is not working on the behalf of people, to just dismiss the idea of Ambassador for some arrangements that were negotiated over. I thank TheJakal for making this heard about, so if not now.. in future we might hope to see this Live! People join and fight a lot when they train because of DO, and while they do they don't realise strenght no longer grows with levels, and they quickly find themselves in higher divisions while players with 120k Strenght don't care about other people's BH's they say RESPECT MINE only if someone else stronger comes in.. which makes people leave the game on daily basis.. When there were a thousands and thousands of players someone would pay 5euro.. not someone hundreds of people would, its better to get 1000 of people to buy 5euro gold than 20 people to buy 100 euro per month or even year..
we need to MAKE THIS GAME ALIVE AGAIN. MORE PLAYERS EQUALS MORE MONEY. YOU ARE HAPPY, WE ARE HAPPY. BUT WE NEED TO BE EQUAL, THIS IS TOO LITTLE PLAYERS AND TOO MUCH PAY2WIN. AND EVEN ONES WHO PAY WILL NOT PAY IF THIS GAME DIES. I LOVE THIS GAME AND I SPENT A LOT OF MY YEARS ON IT. BEST OF REGARDS TO THE TEAM. Why should country ambassadors have more power than a current MoFA? This does not mean they are all doing a job on the forum as well. remember that most(if not all) mods/admins are players first. edit: it is possible some mod names might not be in that list. Your answer is inconsistent: TheJackal is just a n00b. Anyway, as I already implicitly stated, there should be some improvement about ministers first (players filled page of topics about the matter). The MoFA being able to appoint ambassadors and creating a "list" with all the current amabassadors (maybe below the MPP list) should be a good first step. Making free for them to publish in the country destination should be also a good and easy way to make it a bit easier. There are a lot of small and easy to code changes that would help a little people to be more involved and can't harm in any way.